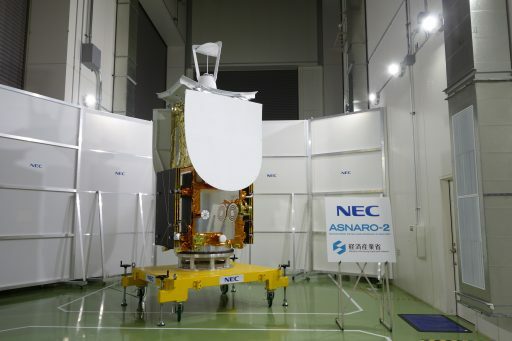 Japan’s Epsilon rocket is gearing up for liftoff from the country’s Uchinoura Space Center on Wednesday with the ASNARO-2 satellite – a compact, but high-performance radar-imaging satellite packing a high-resolution X-band radar into a compact satellite platform. Liftoff is targeting 21:06:11 UTC, 6:06 a.m. local time on Thursday – the opening of a 24-minute window. Wednesday’s launch is the second flight of Japan’s Enhanced Epsilon rocket – building on the success of the baseline Epsilon rocket flown in 2013 and the first launch of the Enhanced Epsilon in 2016 that demonstrated a 30% performance increase. 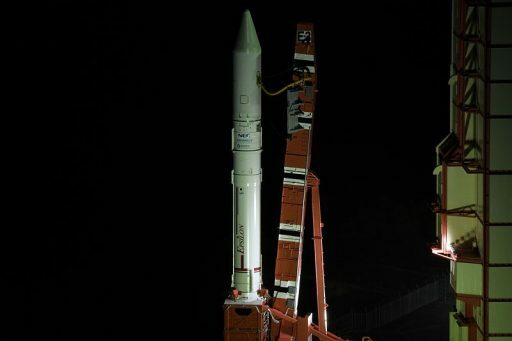 Launch was initially targeting November 2017, but had to be pushed due to an electrical problem on the four-stage rocket and another delay was called this week, slipping the launch one day to dodge potential inclement weather at the Kagoshima launch site. Hidden under Epsilon’s payload fairing is the second satellite of the ASNARO program, aiming to further the development of an open-architecture small satellite platform hosting compact payloads with high-performance characteristics matching those of flagship satellite missions. 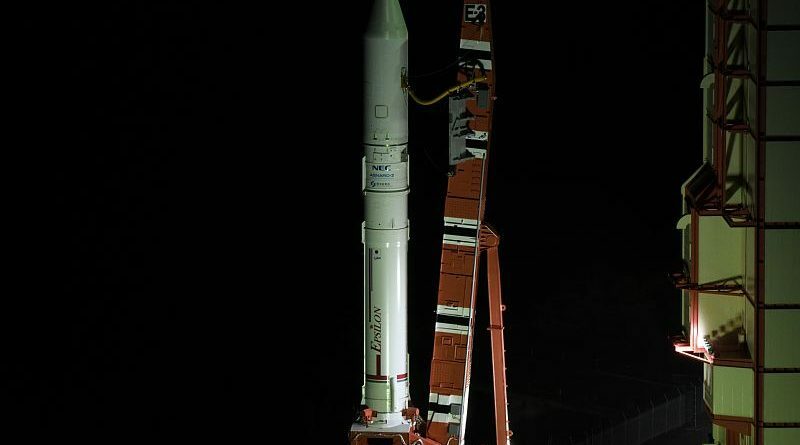 The first ASNARO satellite launched in 2014 atop a Russian Dnepr rocket and hosts a high-resolution, multi-band imaging system capable of a ground resolution better than 0.5 meters for panchromatic and two meters for color imagery. 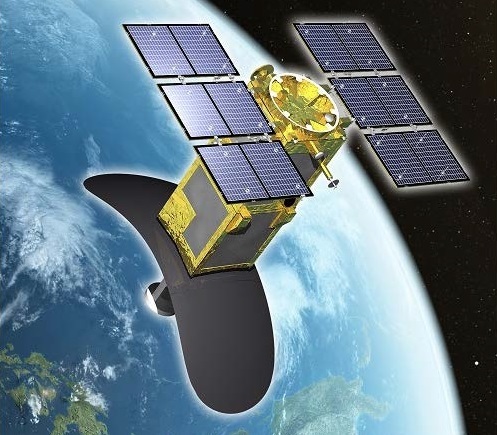 Finding its roots in 2008, ASNARO had the overall objective of developing a satellite platform capable of hosting a wide variety of remote sensing instruments and, through a series of missions, demonstrating this capability in an operational environment. 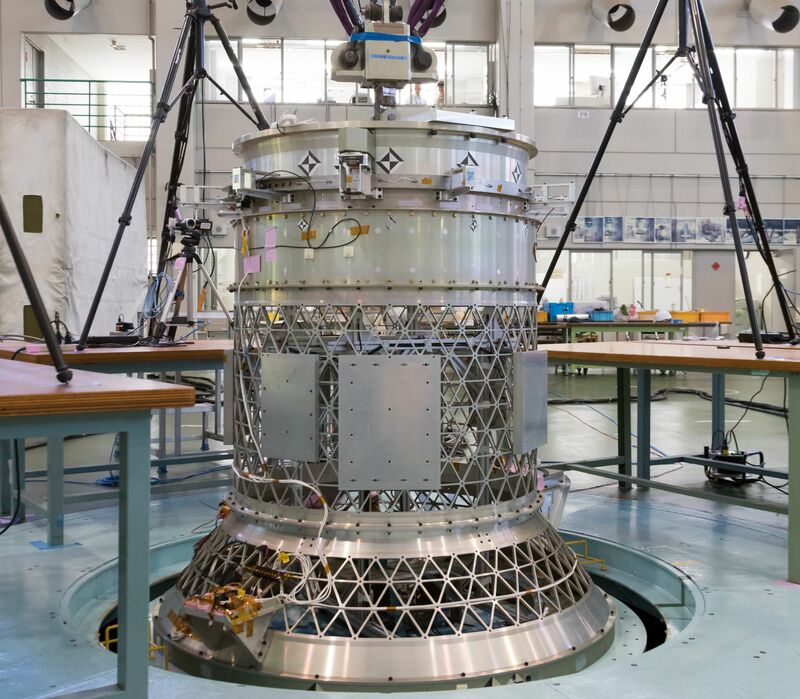 The result of the development initiative was the NEXTAR satellite platform, designed by NEC in cooperation with the Japanese Aerospace Exploration Agency. 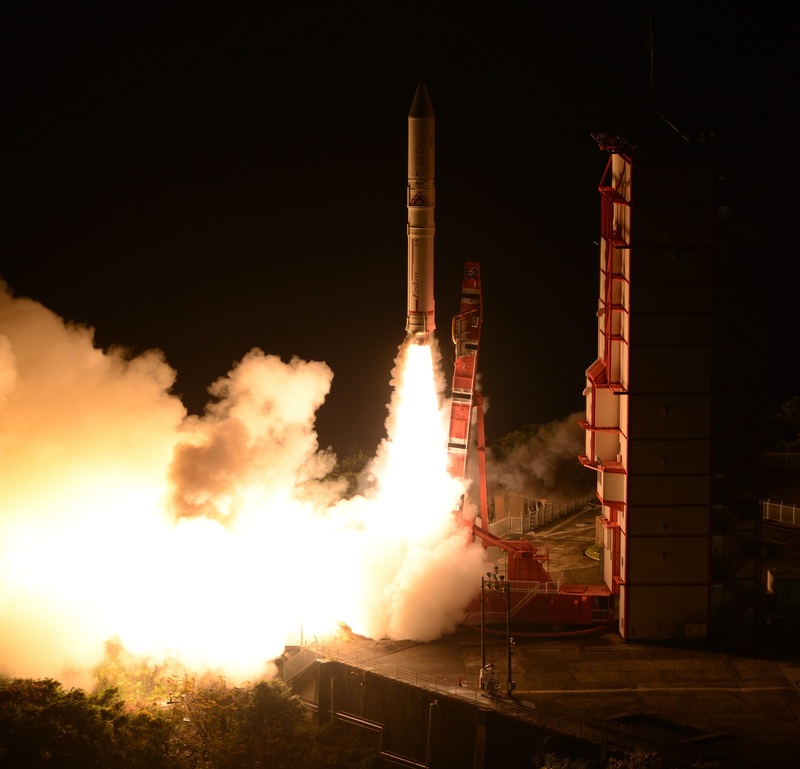 NEXTAR has been flown very successfully on the ASNARO-1 mission as well as Japan’s ERG science satellite studying energetic particles in Geospace. ASNARO-2 combines the NEXTAR small satellite bus with a 1.5-Kilowatt X-Band Synthetic Aperture Radar, comprising a three-segment parabolic antenna and a new type of gridded-pulse Traveling Wave Tube Amplifier in its front end electronics package. The 570-Kilogram satellite can achieve an image resolution better than one meter when operating in its high-resolution mode that captures imagery across a 10-Kilometer frame while ScanSAR imaging, taking advantage of the satellite’s agile pointing system, can deliver wide-area imaging across a 50-Kilometer swath – allowing ASNARO-2 to act as a powerful tool for all-weather, day and night imaging. ASNARO-2 is targeting a Sun Synchronous Orbit 504 Kilometers in altitude, inclined 97.4 degrees with a Local Time of Descending Node at 6:00 hours – a typical dawn-dusk orbit chosen for the power generation needs of the satellite given the high power demand of the radar and the limited solar array area due to the satellite’s compact platform. 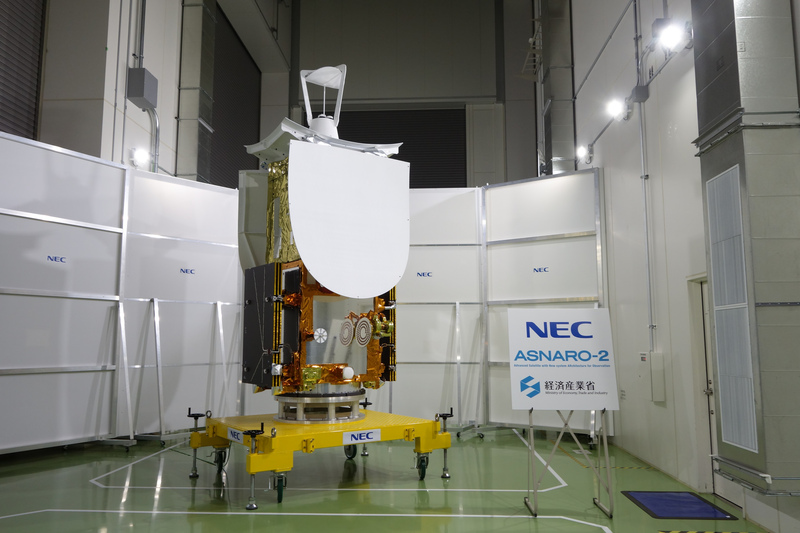 Building a two-satellite constellation orbiting at the same altitude, ASNARO-1 and 2 will be able to support multi-time observation of targets in optical and radar vision. For its launch, ASNARO-2 is relying on Japan’s Enhanced Epsilon rocket, flying for the first time in its Enhanced CLPS configuration that adds a liquid-fueled fourth stage to the all-solid three-stage stack to give Epsilon the ability to inject payloads into circular Sun Synchronous Orbits – requiring multi-start capability on the upper stage. The standard Epsilon flew in a four-stage configuration in 2013, but the enhanced version has only flown in its three-stage variant. Epsilon was designed as a low-cost launch vehicle suitable for a variety of small-satellite missions of scientific or operational character. The rocket has been developed as the replacement for Japan’s M-V which, at up to $90 million per launch, was deemed too expensive. 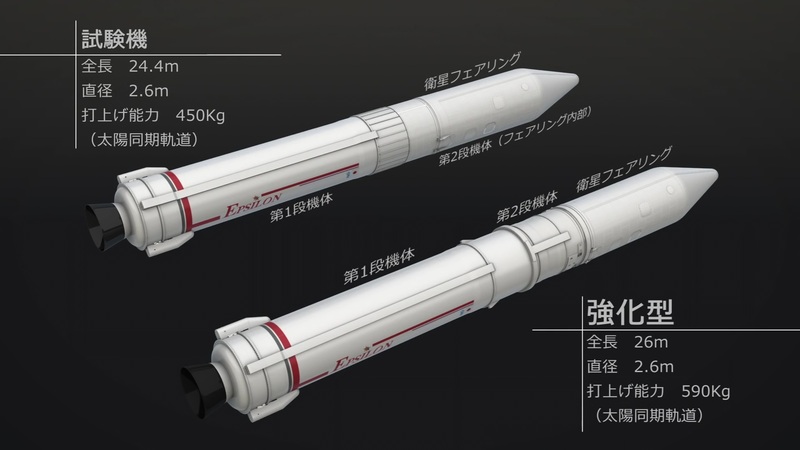 To reduce cost, Epsilon was conceptualized to use a number of heritage components from different Japanese rockets, support a quick launch campaign, and incorporate a high-degree of automation in its countdown and flight operations. The design of the Enhanced Epsilon was largely driven by the needs of the ERG mission and the ASNARO constellation, requiring its performance to be increased by around a third to lift up to 590 Kilograms into a Sun Synchronous Orbit. Epsilon stands 26 meters tall, is 2.6 meters in diameter and weighs in at nearly 96 metric tons when flying in its four-stage configuration – comprising three solid-fueled stages borrowed from other Japanese launch vehicles and a purpose-built fourth stage sitting atop for the final boost into the operational orbit. The first stage of the rocket is a 75-metric ton SRB-A3 Solid Rocket Booster taken from the H-II series of rockets as an existing design that was modified for three-axis control during ascent by adding a solid-fueled roll control jet. Stage 2, designated M-35, represents the biggest change between the inaugural Epsilon and the enhanced version – replacing a deployable nozzle extension with a rigid vacuum-optimized nozzle, increasing the diameter of the Solid Rocket Motor and switching to a cheaper, but equally powerful propellant formulation. The third stage also switched from an extendable nozzle to a rigid design, causing Epsilon to grow by 1.6 meters compared to the rocket flown in 2013. The design change on the second stage, widening its diameter to match that of the first stage, also had the side effect of increasing the space available under the rocket’s payload fairing because the second stage no longer needs to be protected by the fairing – allowing taller satellites to fly on the Epsilon rocket. Epsilon has been designed as a highly autonomous launch vehicle, allowing for a fairly compressed countdown taking just two hours and 40 minutes from the start of countdown operations to liftoff. The count is handled by ROSE, the Responsive Operation Support Equipment – an autonomous control system capable of handling the entire countdown sequence and only requiring human intervention in the event of problems. Provided all checkouts go as planned, weather is favorable and the Uchinoura Range Control Center provides clearance, ROSE will switch into its terminal countdown mode at T-70 seconds to take Epsilon through final critical events including the transfer to internal power, arming of igniters and the activation of thermal batteries, setting in motion an irreversible set of events leading up to liftoff. ROSE will make a final health check at T-1 second before switching off and handling all responsibility to the rocket’s flight control system. Lighting up its first stage, Epsilon will lift off its launch table with a thrust of 239 metric ton-force, rising with an initial thrust-to-weight ratio of nearly 2.5. The SRB-A3 first stage will fire for one minute and 48 seconds, in the process accelerating the vehicle to a speed of 2.3 Kilometers. After burnout, Epsilon will hold onto the first stage for a brief passive flight phase with payload fairing separation occurring at T+2:31 at an altitude of 123 Kilometers, revealing the rocket’s two upper stages along with the ASNARO-2 satellite. 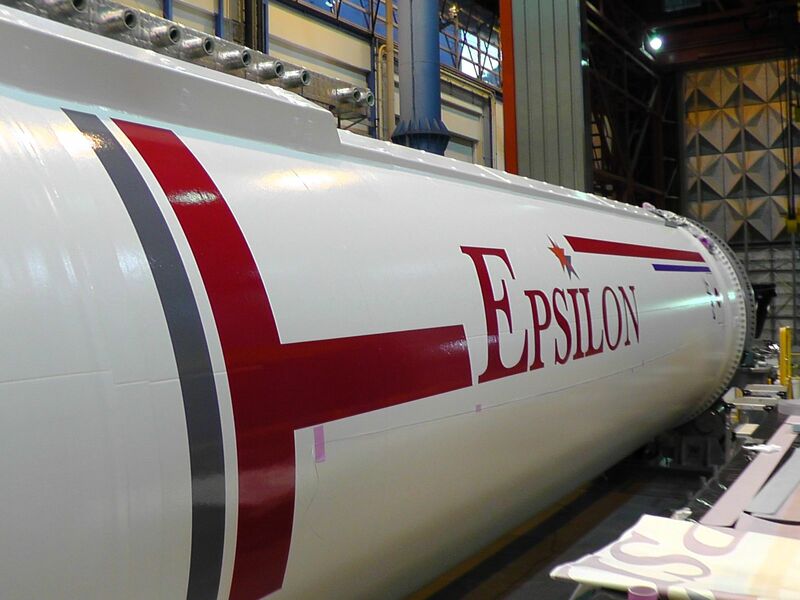 The 11.7-meter long booster drops away from the vehicle two minutes and 41 seconds after launch and, four seconds later, Epsilon will ignite the M-35 second stage, tasked with raising the vehicle’s speed by 2.8 Kilometers per second. Taking advantage of its greater fuel load of 15 metric tons, M-35 will fire for 129 seconds with a thrust of 45 metric ton force. The launch vehicle will enter another coast phase at T+4 minutes and 54 seconds when thrust on the M-35 tails off, to be followed by stage separation at T+6:30 and ignition of the third stage four seconds later. The KM-2Vc stage consumes two and a half tons of propellant and delivers ten metric-ton-force of thrust over a 89-second burn, raising the vehicle’s speed by another 3.2km/s to inject the stack into a preliminary orbit. 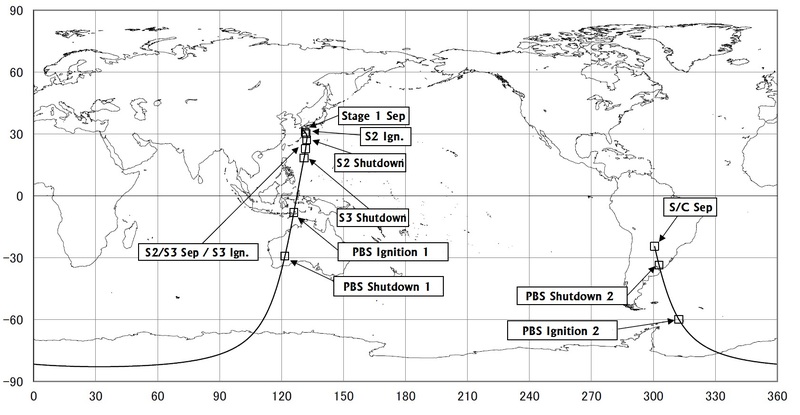 Separation of the Post Boost Stage (PBS) is expected at T+9 minutes and 54 seconds and its first ignition will occur 14 minutes and 31 seconds into the flight. The Post Boost Stage of the Enhanced Epsilon carries 145 Kilograms of Hydrazine monopropellant, employing a larger tank than its predecessor to fire its 0.4-Kilonewton thrusters three minutes longer than the initial PBS version. 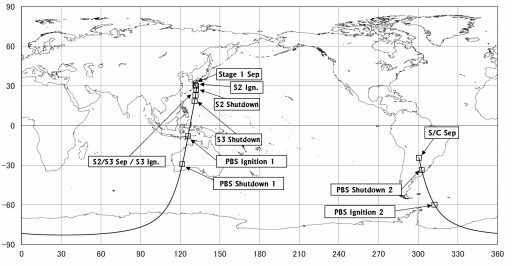 The first PBS burn, tasked with setting the high point of the orbit to just over 510 Kilometers in altitude, is expected to last five minutes and 16 seconds. Afterwards, the stack will coast for 23 minutes to complete the circularization maneuver when passing the high point of the transfer orbit. The second burn, planned to start at T+43:04, will be seven minutes and seven seconds in duration and aims for an injection orbit of 494 by 509 Kilometers, inclined 97.4 degrees for separation of the ASNARO-2 spacecraft 52 minutes and 35 seconds after launch.